Have you unlocked the legendary Commander Luke Skywalker and looking to share your vast knowledge of this rebellion hero with the community? Are you a newer player who would like to borrow a really strong Commander Luke Skywalker to use on the Light Side, Cantina, Mod Battle or challenge holo-tables? 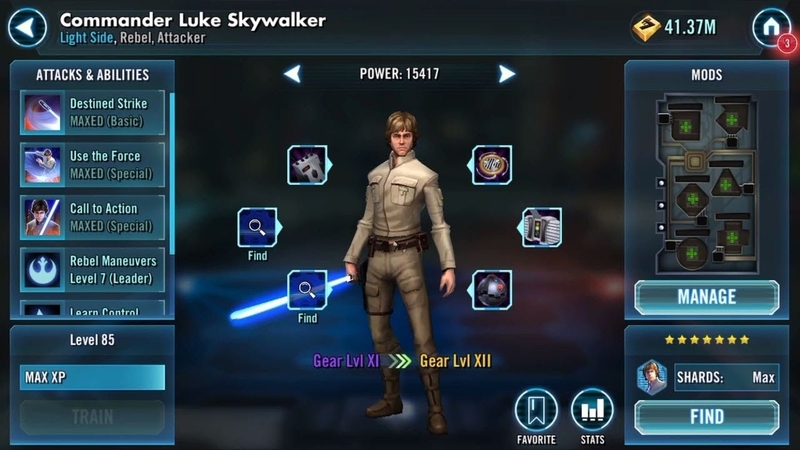 Are you an older player who did not unlock Commander Luke Skywalker but want to test him out? Here, veteran players with Commander Luke Skywalker can post their ally codes, allowing players who do not have Commander Luke Skywalker to become allies with them and borrow him! > Post your ally code if your willing to share your CLS with the community! EDIT: Doing both Thrawn and CLS was too much. Please see the Thrawn thread if you need one. Edit: Not accepting requests from those below lvl 50. Play the game a bit. FULL. Sorry to those who got rejected, but I got a lot of requests! Level 85, Maxed gear, zeta on it bind all things. Edit: 10 spaces now open first come first serve! L85, G11, 7*, Fully Zetas. Edit - vacancy filled. Thanks! Just learned that requests were clogging my ally list, so have quite a few spots. Please let me know if you would like me to make CLS leader. 199-369-789, or just msg me on here to set up a time. I'll keep you added for 24 hours minimum. Let me know if you need longer. G11, Lvl 85, Zeta on "It binds all things"
Sowwy i am officially full now. G12 CLS 250 odd speed. 1 Zeta on IBAT. Please remove yourself once you no longer need help to free up space for others who need to borrow a character. Good luck!